A good way to understand the vastness of Australia’s wine-producing landscape is to compare the island continent to the United States—not the viticultural U.S. but the whole country. Consider that the Hunter Valley, Australia’s easternmost wine region, in New South Wales, is more than 2,500 miles from Margaret River, home to the country’s farthest-west vineyards. That’s almost 400 miles farther than the distance from Atlanta to San Diego. The geographical differences are stark but to this day wine lovers speak of “Australian wine” in a broad-brush manner that’s by turns amusing, bewildering, frustrating and depressing to the country’s producers. Australia’s vineyards spread across an area that’s a thousand miles longer than the distance from Galicia to Kremstal (Austria) but I sure don’t hear many wine drinkers talk much about “European” wine in such a generic manner. Australia can be considered a New World wine region by European standards but in the context of non-European wine-producing areas it’s actually quite old, with its roots, literally and figuratively, stretching back to the 1820s. Even more intriguing is that Australia can lay claim to some of the oldest producing vines on earth, including what some say are the most ancient Grenache and Syrah (almost always called Shiraz in Australia) plantings anywhere. Old vines are a common theme across the country—especially in South Australia—and the wines that they produce can be serious show-stoppers for their depth and power; they often sell for extremely reasonable prices as well. As a jumping-off point for the wines reviewed in this article, a brief overview of most of the country’s best-known and mostly highly regarded wine regions is in order. The operative word here is “brief” as any one of the following areas is book-worthy, as are many additional regions that I have left out in the interest of brevity. Western Australia, located some 2,500 miles from Sydney, is the source of many of the country’s most sought after, small-production and consequently expensive wines. Fortunately the overall standard of wine quality from this vast state is uniformly high. The ocean-influenced Margaret River region is especially intriguing for the fact that it produces not only most of Australia’s most elegant, complex and Bordeaux-like Cabernet Sauvignons and Cabernet-based blends but many of the country’s most stylish and highly regarded Chardonnays as well. In fact, this zone is home to two of the country’s most consistently fine Chardonnay producers, Cullen and Leeuwin Estate, whose versions of this variety should also be counted among the best in the New World, period. Those two wineries are also, unsurprisingly, at the top of the red wine heap in the Margaret River. High-quality Sauvignon Blanc and Sauvignon Blanc/Sémillon are produced in Margaret River as well, as are a handful of impressive Pinot Noirs, Rieslings and Syrahs, but Cabernet Sauvignon and Chardonnay are the clear marquee varieties here. Unfortunately, the wines of the region will never be cheap. Land prices are high, as are labor costs. Even more important, the wealthy city of Perth, with by far the largest concentration of people in Western Australia, has an insatiable thirst for the local wines, so a good portion of the Margaret River’s relatively small vinous production never makes it far from home. In 2015 Margaret River experienced a rainy winter and spring, which resulted in a difficult flowering and an ultimate reduction in production. The summer was dry and moderately warm and conditions remained favorable through the harvest. Quality so far appears to be good to very good even if there isn’t much wine to go around. Some of Australia’s most impressive examples of Riesling emanate from the cool Frankland River zone, which sits roughly 225 miles south and slightly east of Perth. Frankland River is the most famous of the five sub-regions of Great Southern, along with Albany, Denmark, Porongurups and Mount Barker, and the one that has made the most headway in the international wine market. That’s no surprise as this cool, hilly, relatively inland region is well known for producing some of Australia’s most racy, sharply delineated Rieslings. The best examples of Frankland River Riesling bear comparison to those from the Clare Valley, which have long been considered the gold standard for this variety in Australia and are among the best in the New World. Production here is limited, though, as wineries in the Great Southern region are almost all on the small, artisanal side, so some hunting may be necessary to land the top wines. The 2015 vintage in Great Southern brought low yields due to a poor flowering and quality looks mixed, with many grapes harvested at lower-than-usual sugar levels. 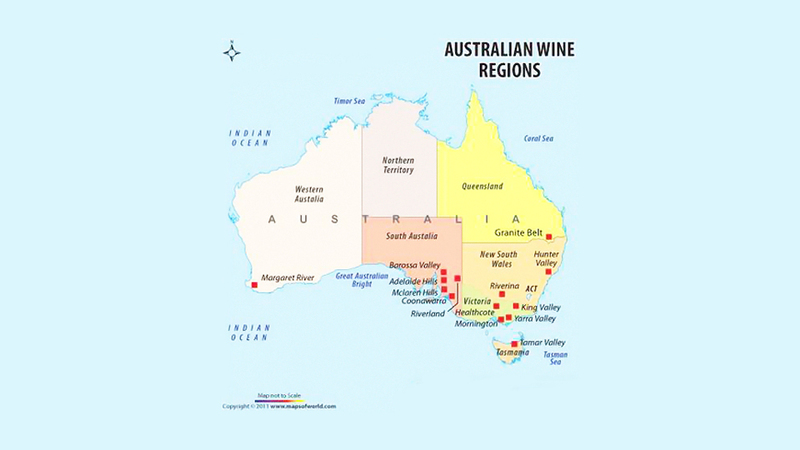 The vast majority of Australia’s most famous wine regions are situated in the state of South Australia, which offers a vast range of geographic and climate conditions and thus a predictably broad variety of wine styles from a large number of varieties. If there ever was a region that defied efforts to generalize about wine styles, South Australia is it. The finest dry New World Rieslings that I’ve ever had the pleasure to drink came from Clare Valley, which actually isn’t a valley at all but rather a high-altitude plateau that enjoys breezy conditions and cold nights that create an ideal growing situation for cool-climate varieties. The best known and to my mind the top producer of Clare Valley Riesling is Jeffrey Grosset, whose wines created the paradigm for the Clare Valley style with their intense lime-and-grapefruit citrus character, razor-sharp acidity, pronounced minerality and ability to age effortlessly. The overall standard of quality for Clare Valley Riesling is remarkably high; in fact, it’s pretty tough to find an example in the market now that isn’t at least very good. The 2016 Rieslings have turned out exceptionally well, with bright acidity, expressive bouquets and excellent balance. Two thousand fifteen is also an outstanding vintage, having produced fruity wines with the backbone to retain freshness and last well. For many wine drinkers outside Australia, Barossa Valley wine is Australian wine, at least for the last couple of decades. That outsized, high-alcohol, Xtreme fruit bomb of a Shiraz that burned itself into your taste memory back at the turn of the century? Most likely it came from Barossa. The polarizing character of those wines—and there were plenty of them sent around the world—still dominates many wine lovers’ view of Shiraz in particular and Australia in general, and usually not in a good way. But those bottlings were aberrations—and still are, to the extent that they are being made today--and the rest of the Barossa, much less the country, deserves a more sober (as it were) critique by open-minded wine consumers. Growing conditions here are hot, often torrid, and grape sugars routinely soar to levels that mean the wines will easily crest 15% alcohol, or even 16%. The trick for winemakers is to ensure that there’s enough freshness to balance ripeness in the finished wines and that’s made possible by the wide diurnal shifts that affect much of the region. On the technological side of the equation, vine irrigation is common in the warmest sectors here, along with acidification, reverse osmosis and water additions, practices that are common in most other hot wine-growing climates in the world, whether producers admit it or not. This is not to say that Barossa Valley wines will qualify as “elegant” for wine lovers whose benchmark reds come from the continental climates of Europe or the cool coastal regions of America’s West Coast. They won't. But in comparison to most wines from central Spain, southern France and inland California, the best Barossa wines stand up quite well. They also, as a rule, age slowly and positively, shedding their overt fruit and baby fat over time and picking up a more savory character that can sometimes remind one of the northern Rhône. The 2015 growing season began with plenty of welcome rain in winter and early spring (precipitation is always welcome here) followed by a warm, mostly dry late spring and summer. Near-ideal conditions carried through the summer and harvest. This is shaping up to be a classic vintage. Located within the Barossa zone, the cool, hilly Eden Valley produces mostly Shiraz and Shiraz-based wines that are markedly different from those of the Barossa Valley and often distinctly Old World in style, displaying bright acidity, distinct florality and red fruit character. Yalumba and Henschke are two of the region’s best producers and their wines are widely available worldwide. It’s cool enough in most of the Eden Valley to produce outstanding dry Riesling as well and, in fact, that variety makes up almost 25% of the region’s vine plantings, with Shiraz slightly ahead at just over 31%. Those whose tastes run to dry Austrian or German Rieslings owe it to themselves to check out what’s happening here; producers like Pewsey Vale, Henschke, Mesh and Penfolds are great places to start. Riesling was a top performer in 2016: the wines are elegant and precise, with the equilibrium to age. Two thousand fifteen looks highly promising to exceptional for Shiraz thanks to a cool, steady growing season and a dry, perfectly timed harvest with optimally ripe grapes. Sauvignon Blanc has been especially successful here and I’d count the region as the most reliable source for stand-alone renditions of the variety in Australia. The cool, higher-altitude, ocean-influenced geography sets the stage for taut, nervy, Loire-style wines that usually sell for extremely reasonable prices given their quality. With rare exception the wines are made to drink upon release but the best examples will reward some patience thanks to their zesty acidity and balance. Some serious Chardonnay is also made in this region, with more than a few showing the sort of vibrancy, minerality and precision that one might associate with Chablis. The general style of Chardonnay here definitely references the Old World more than the New and the best versions are excellent cellar candidates. Riesling also grows well in the Adelaide Hills and an increasing number of serious examples of Cabernet Sauvignon and Cabernet-based blends, Pinot Noir and Shiraz are being made here as well, all of them in an elegant, focused, low-octane style that reflects the area’s growing conditions. Those looking for Barossa Valley-style fruit bombs aren’t going to find such wines in these parts. Two thousand sixteen provided an above-average quantity of high-quality fruit thanks to well-timed spring and late summer rains. The white wines are turning out fresh and silky, while the 2015 reds show real energy and excellent balance. A full range of white wines of every imaginable style and weight is produced from the widely varied soils here, from dry Rieslings and Sauvignon Blancs to richer Marsanne, Roussanne, Viognier and Chardonnay bottlings. But the region is best known for its powerful yet well-balanced red wines, especially those based on Shiraz, with the other Rhône red varieties—and Cabernet Sauvignon—playing supporting but extremely important roles as well. This is one of Australia’s oldest wine-growing regions: its first vines were planted in 1838 and its first commercial wineries opened in 1850. Some of the country’s best-known and most widely exported producers are located here, such as d’Arenberg, Wirra Wirra, Chapel Hill and Kay Brothers Amery. Its location near the capital city of Adelaide, with a population of almost 1.2 million people, has ensured a robust local market for the best wines, which means that some of the area’s most sought-after bottlings will always be tough to find in export markets. My early look at the 2016 white wines from McLaren Vale turned up wines that are lively and precise, with intense perfume and very good depth. The region’s 2015 reds come from a short harvest but look to be of very high quality, with strong concentration allied to good energy. Situated near South Australia’s border with Victoria, Coonawarra is actually a sub-region of Limestone Coast but its fame has for years overwhelmed that of the larger zone. That renown is due to the fact that many of Australia’s most highly regarded Cabernet Sauvignon and Cab-based blends have been made from fruit grown here since the 1950s. These wines tend to be quite solid on release, with very good depth and tannic structure that ensure reliable cellaring potential. A well-aged and carefully cellared Coonawarra Cabernet from the likes of Penley Estate or Wynn’s has fooled me more than a few times into thinking that I was drinking a top-notch Left Bank Bordeaux (there are remarkable climate similarities between these two areas), such was their savory character, chewy texture and bright acidity. Fans of old school Cabernet Sauvignon should be pleased with the 2015s from Coonawarra. An ideal growing season and issue-free harvest produced clean, ripe fruit with good but not excessive tannin levels and healthy acidity. The better wines should age slowly and gracefully. The majority of Australia’s most elegant wines, especially those made from cool-climate varieties like Pinot Noir and Chardonnay, come from the state of Victoria. Situated in the southernmost point of the country, its wine-growing regions enjoy the cooling influence of the Southern Ocean and its hilly sites benefit from wide diurnal temperature shifts. Shiraz is also very successful across Victoria, producing wines that are usually distinctly northern Rhône-like in personality. Cabernet Sauvignon also has a long, positive history across the region, producing wines that can often rival those from Margaret River for elegance, balance, savory character and cellarworthiness. The roster of top-drawer wineries in the Yarra Valley, which sits roughly 50 miles east of the state capital Melbourne, features an all-star lineup of Australian producers, with Giant Steps, Mac Forbes, Yarra Yering, Yering Station and Yeringberg among the best known. Pinot Noir and Chardonnay make up the majority of the best wines, in my opinion, with Shiraz and Shiraz-based blends and Cabernet Sauvignon close behind in quality if not sheer number. There’s a distinctly European cast to most Yarra Valley wines, which should be no surprise in light of the area’s geography and climate. Given its proximity to Melbourne and its world-class restaurant scene, its natural beauty and the fact that there are more than 160 wineries here, it’s no surprise that the Yarra Valley is a popular tourist destination and that much of the region’s wine production is consumed locally. Many of the Yarra Valley’s best limited-production wines are a chore to find outside Victoria. All varieties performed exceptionally well in 2015, thanks to a cool growing season punctuated by a tiny bit of well-timed rain and ending with a warm, picture-perfect fall and harvest. 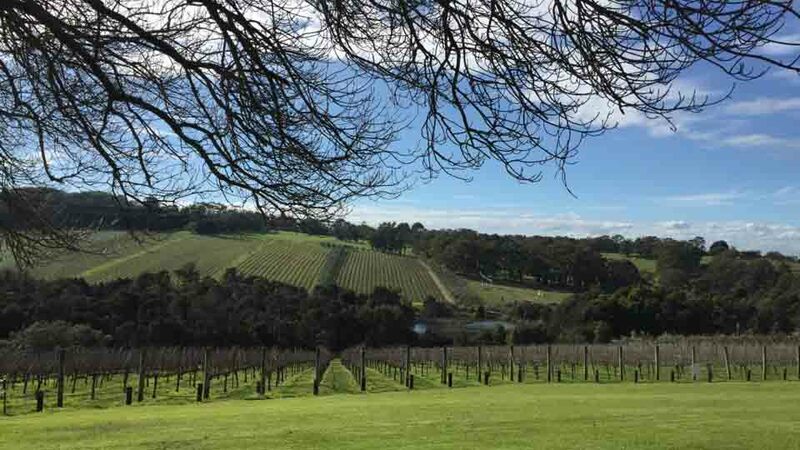 Located roughly an hour’s drive north of Melbourne, Heathcote is a relatively cool inland region justly renowned for producing powerful, structured yet graceful Shiraz and Cabernet Sauvignon-based wines with enviable track records for aging. The nutrient-poor pre-Cambrian soils found here are between 500 million and 550 million years old—among the oldest to be found on earth. There is also a good amount of granite in the area, which is extremely hospitable to Shiraz, as any northern Rhône producer, such as Michel Chapoutier, will tell you. In fact, Chapoutier was impressed enough to bet money on it by setting up a project here with the Laughton family of Jasper Hill (the most famous winery in Heathcote) back in 1998. Like the rest of Victoria, Heathcote enjoyed a smooth, mostly cool 2015 growing season and a harvest that went off under ideal conditions. It’s a bit early to make a call on Cabernet-based wines but, from my handful of tastings of these wines to date, they look highly promising. If any region of Australia can compete with the Yarra Valley for high-quality Pinot Noir and Chardonnay, it would be the Mornington Peninsula. 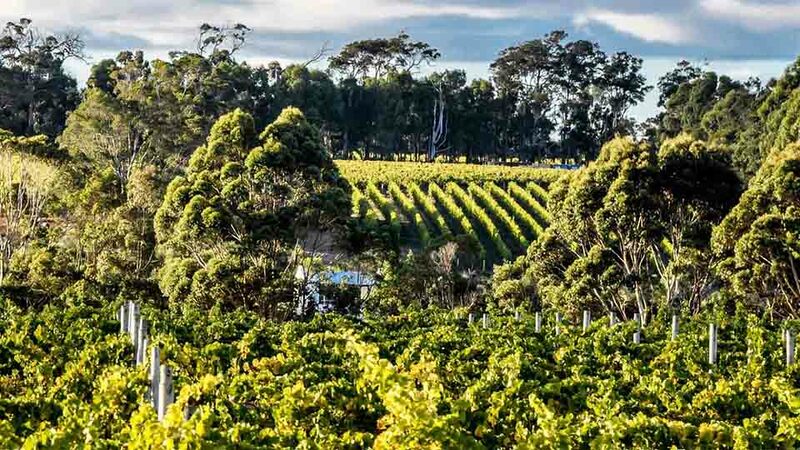 Located just under 50 miles from Melbourne, the cool, wind-swept vineyards here produce wines of uncommon clarity and finesse. Tasting a Pinot Noir from a top producer such as Ten Minutes by Tractor, Moorooduc or Paradigm Hill for the first time can be a head-spinning experience for those who think that graceful versions of the variety are exclusive to Europe, Oregon and coastal California. Victoria’s Chardonnays can be equally impressive but they’re not easy to track down away from their home turf. The cool-climate varieties planted in the Mornington Peninsula experienced an ideal growing season in 2015 and the harvest went off without a hitch. Both white and red wines are shaping up to be of very high quality and among the best of the last decade. 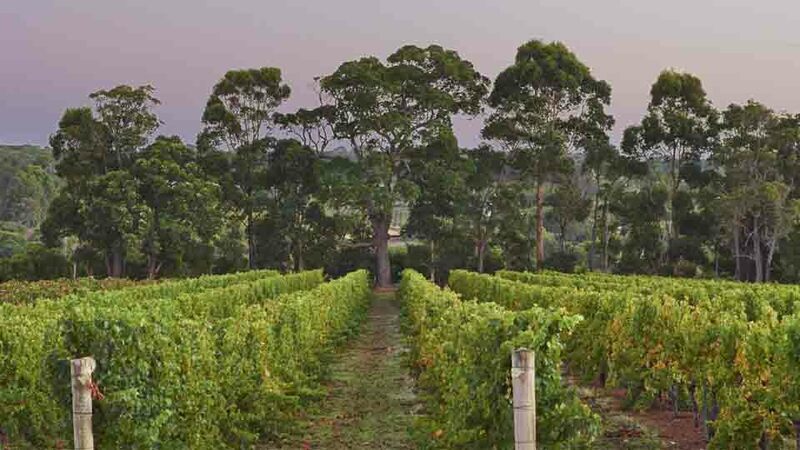 Located just over a three-hour drive north of Sydney, the Hunter Valley was first planted to vines in the 1820s, making it Australia’s oldest wine-growing region. The region is especially warm and humid, which makes it a challenging place to grow the thin-skinned Sémillon, which is the variety for which the Hunter Valley is best known. Left too long on the vine, Sémillon is an easy target for noble as well as ignoble rot so the fruit here is almost always harvested very early, at sugar levels that produce high-acid, extremely ageworthy wines that clock in as low as 10% alcohol in many vintages. That style has found a following over the decades, to the point that dry Sémillon is now the touchstone wine of the region. Shiraz is the dark horse in the Hunter Valley and Brokenwood (whose Sémillons are also among Australia’s best) has been the standard-bearer for quality since it released its first Shiraz from the 1983 vintage. In fact, many Australian wine aficionados count Brokenwood’s Graveyard Vineyard bottling as among the country’s finest, regardless of region. Tyrrell’s also makes first-rate Shiraz but these bottlings are often overlooked because of the winery’s Sémillons, which are the most renowned renditions of the variety in Australia. Sémillon was highly successful in 2016 after experiencing a bizarre growing season that saw epic rains during the summer followed by the driest autumn in a generation. The wines should turn out to be exceptionally ageworthy thanks to a combination of concentration and healthy acidity. Conditions were challenging for Shiraz in 2015 as a consequence of rain and hailstorms, making it a vintage to buy with care. With its heavily ocean-influenced situation and extreme southern location it isn’t surprising that the island of Tasmania produces bright, racy wines from cool-climate varieties, notably Pinot Noir and Chardonnay. Josef Chromy, Tolpuddle and Dalrymple’s wines are consistently strong performers with reasonably wide distribution. Some of Australia’s finest sparkling wines are made here but local demand, not to mention often ambitious pricing, has made them rare birds in export markets. Tasmania is steadily gaining a foothold abroad, though, as more and more producers see the advantage of making their wines available to an outside world that is steadily developing a taste for the kind of graceful, nervy wines made here. As with the rest of the southern tier of Australia in 2015, Tasmania enjoyed an ideal, relatively cool growing season that allowed for fresh wines with textbook balance of concentration and liveliness. I tasted all of the wines in this report in New York over the last several months. Our next installment of Australian reviews will include wines I try during my upcoming trip to Western Australia, South Australia and Victoria, as well as plenty of others that I’ll taste back home.